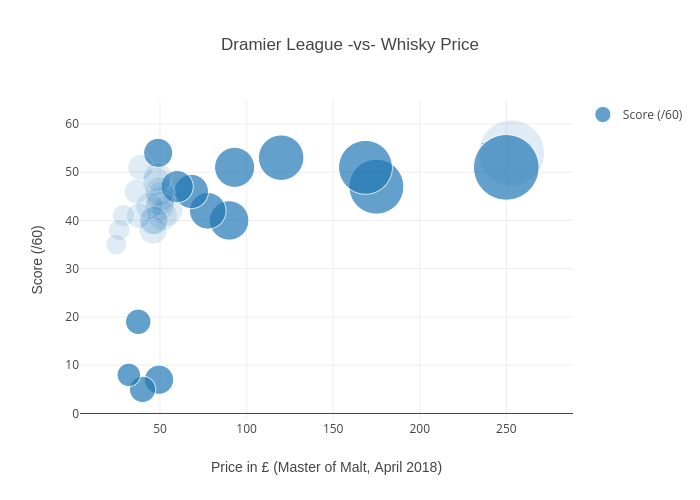 Acwarmington's interactive graph and data of "Dramier League -vs- Whisky Price" is a scatter chart, showing Score (/60); with Price in £ (Master of Malt, April 2018) in the x-axis and Score (/60) in the y-axis.. The x-axis shows values from 5.767360583934465 to 283.0356407789254. The y-axis shows values from -1.7829113163185628 to 65.93382698082746.